Harvest Playback, March 24th Edition (Hack Week)! 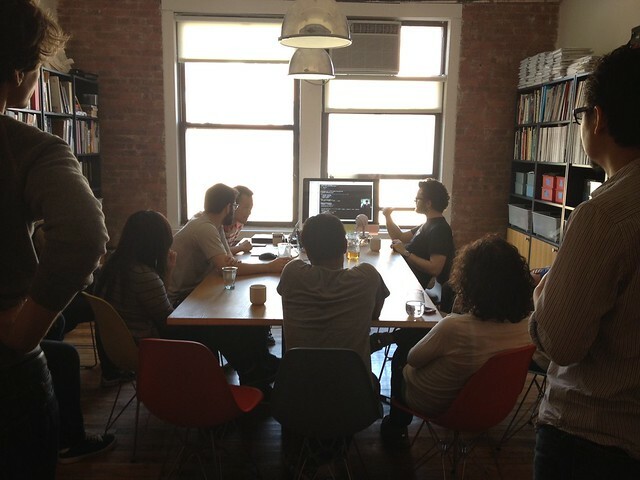 This past week was our first Harvest Hack Week of 2012. Our team took three days off from the normal project schedule to hack on side projects and experiment with new technology. On Friday, we had a one-and-a-half hour presentation on the projects: two mobile web apps using Backbone.js, one Rdio integration, a Chrome extension, an embeddable JS tool, and an experiment with our system logs and stats. We also had a few people who took the opportunity to learn programming on Code Academy. We’re super excited about the Hack Week projects! In the coming weeks, some of these will be released to the public, some will be in open source form, and some will become “core” projects (as in, made into the Harvest application). We will share some of the lessons learned on Tech Time, our recently released engineering blog. Monday, we welcomed Evan to the team, who quickly won us over with a picture of an adorable Jack Russell Terrier. The Great Discontent, an online journal of interviews with “the mad ones“. Thanks, Sri. “Together” vs “Multiplayer”, a great article about language in design, via Lettini. A message from T.J. at 12:30am: “Want some nice white noise to go to sleep? Just drop a `rbenv install 1.9.3-p125` and LISTEN TO THOSE FANS GO WHIRRRRRRRRRRRRRRRRR” We had some trouble with Pow and rvm after the Ruby upgrade, and we’re now using rbenv. It was Danny’s birthday and Doug built a little prank for him. There’s now a way to replace Gmail’s confusing icons with text. Patrick is very excited about this and has updated his original blog post. Awesome watercolor maps by the awesome Stamen. We played some hoops during lunch hours, after the Hack Week presentations. We didn’t have any trouble high fiving. There you have it. We’ve had an exhilarating and productive week at Harvest! See you next week. This was posted in Behind-the-Scenes, Fun Stuff.